Skills get swallowed by survival gear. Depending on the latest knife, gun, or shiny-survival-object may seem like a smart plan. Plans and reality are not the same thing. Nothing’s wrong with reliance on modern survival gear. I own my fair share of modern tools of self-reliance. Thousands of fires can be started with a butane lighter. But what happens when modern equipment and gear fail? And it will fail. And rust. And get lost. And wear out. To handle change, you’ll need skills that gain from disorder and disaster. There may come a time when our instant gear gratification mentality can’t be satisfied and you have to depend on your own hands to make what you need. 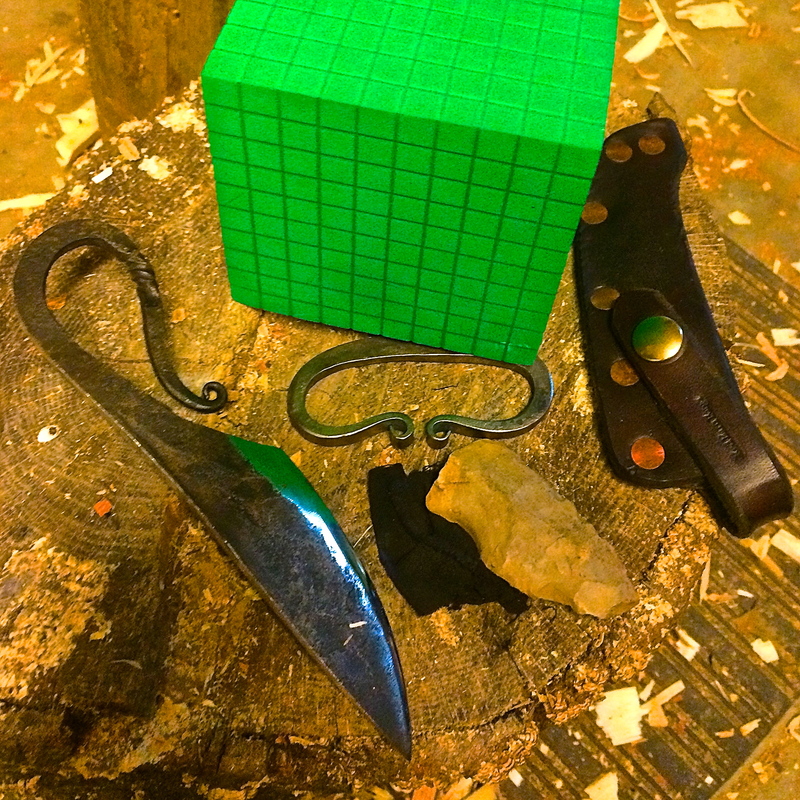 From cordage to cutting tools to combustion… these skills won’t rust or wear out with use! Practicing primitive goes beyond building redundancy in gear. Stone age technology connects you to your ancestral past, no matter which part of this dirt ball your family tree grew. In this context, you appreciate the deep understanding of “primitive” people, their skills, and their knowledge required to use available resources. It takes time and energy to develop these skills. Take fire craft as an example. Once you practice friction fire or flint and steel, the skill of building a proper tinder bundle to blow your primal ember into flame makes your modern fire craft efforts more successful. Shortsighted moderns discount flint and steel as antiquated. Precisely! Practicing primitive gives you options and options make you Anti-Fragile. Considering the fragile world we’re in today, we need a new blueprint for self-reliance. One that benefits from disorder, randomness, and shock. Just as fire feeds on obstacles, so do skills. Anyone who owns a skill faced high barricades that made them stronger. Anti-fragile people are much better at doing than talking. Doers do. Talkers talk. The two are clearly unequal. Doers become anti-fragile. Dirt time with modern tools aids in future, unpredictable survival events. Hours of practice and testing with your cutting tool of choice shows little deviation in the outcome. The modern space blanket in your kit is a proven emergency lifesaver. With use, you’ve discovered your gear’s limitations and abilities. You need dependable, bomb-proof gear. To some degree though, predictable equipment and tools lull us into fragility. Meaning… we become too gear dependent. To be clear, I’m an advocate of carrying a basic kit before heading into the woods… or anywhere else for that matter. But, again, could you benefit from the harm of lost or broken tools in the wilderness? The answer depends on whether or not you have the knowledge and skills to use available resources from your environment. There’s no substitute for investing in skills and knowing how to use local resources. As much as I’d like to try white birch bark as tinder, heard it’s good stuff, we’re fresh out in my neck of the woods. No worries… you can’t walk far in my woods without finding resin rich fat lighter littering the forest floor. Understand that specialized skills and specific resources are needed to replace the 5 C’s of Survivability (Cutting Tool, Combustion, Cover, Container, Cordage). These tools are the hardest to replicate from the landscape. However, it’s doable. Would I willingly trade my fixed blade knife for a stone tool? Not a chance! Unless I’m forced into that situation, I’ll always choose the modern knife as my primary cutting tool. However, stone age technology paved the way for us moderns. 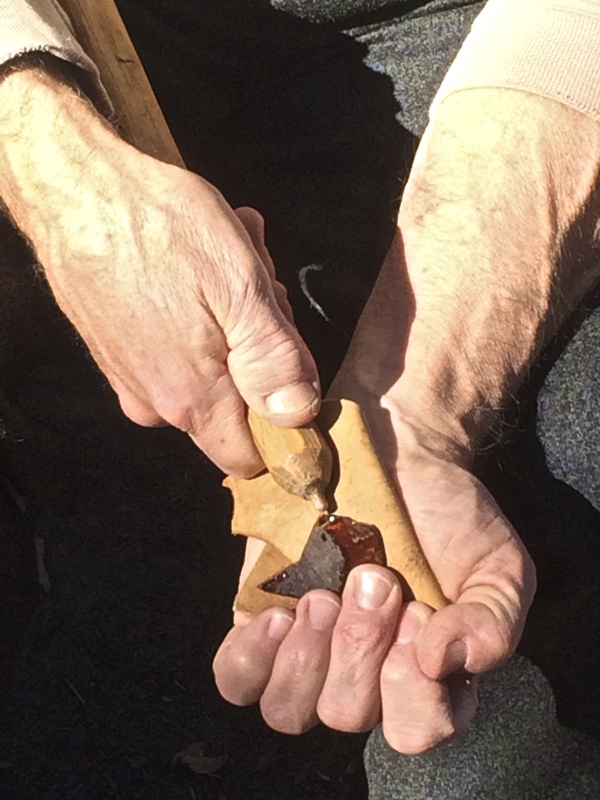 Without mad flint knapping skills, you can create stop-gap edged tools from bipolar flaking. So easy a caveman can do it! Modern sure-fire is packed in all my fire kits. They’re consumable. Mother Nature provides unlimited primitive sure-fire if you know where to look. Your anti-fragile pine responds to shock by exuding flammable resin to protect its life, and, in turn, gives you fire and life. What’s your local go-to natural sure-fire tinder? Do I start all my fires with a bow drill? Nope. I carry a lighter and ferro rod. Do I practice primitive fire with different, local wood? Yup. I’ve found pine, poplar, and cedar to be my favorites. 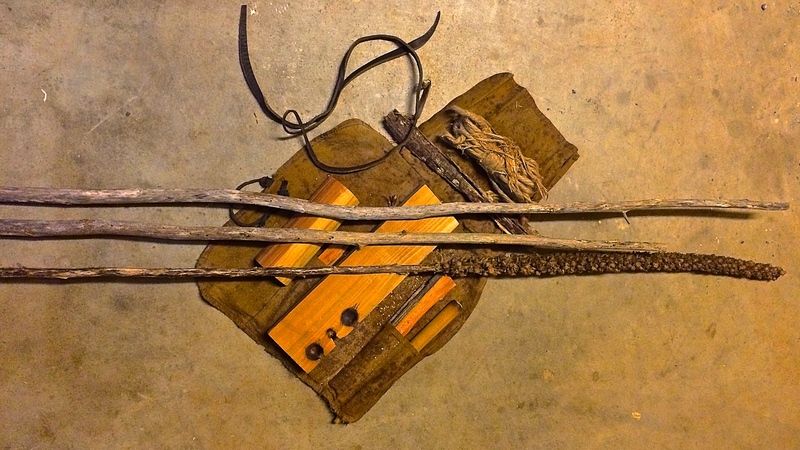 Here’s my personal primitive skill of the month… hand drill fire. I’ve harvested dry mullein and yucca stalks for this experiment. Dirt Road Girl just smiles and watches patiently in the car as her wild husband gathers resourses in the right-of-way. I love my wife! The hand drill should be a comfort zone buster. Stay tuned for my blister update! Caught in the elements without manmade cover will quickly drain your core temperature. To combat heat loss, build primitive shelters with available debris. Calories will be burned, but if this your only shelter option, it’s worth it. 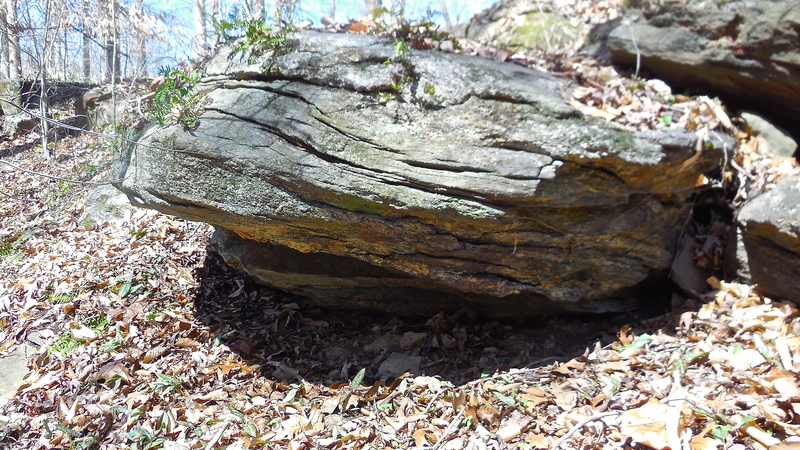 You may get lucky and find a rock outcropping or cave for hunkering down. Even with ready-made natural shelter, add a 4 to 6 inch layer of compressed leaves or natural material in your bedding area as a barrier against conduction. Keep an eye out for other people’s trash. Sad to say, folks are trashy in the woods. But this could be a bonanza for your survival. Glass bottles, drink cans, and plastic are all useful and should be grabbed up. Again, crafting or burning natural containers from wood takes time, resources and skill. Expedient containers for water can be made from bamboo, if available. Turtle shells make great bowls. Baskets can be weaved from plants or crafted with tree bark. If you’re so fortunate as to find a vine of gourds, you’ve just located container heaven. Of course, gourds are a cultivated crop that originated in the wilds of Africa. If you locate a gourd vine, you’re probably close to civilization anyhow. Many natural fibers can be made into functional cordage in an emergency situation. Simply twisting fibers together without fancy reverse twists will provide strong cordage. Roots and vines can be used to lash shelters. 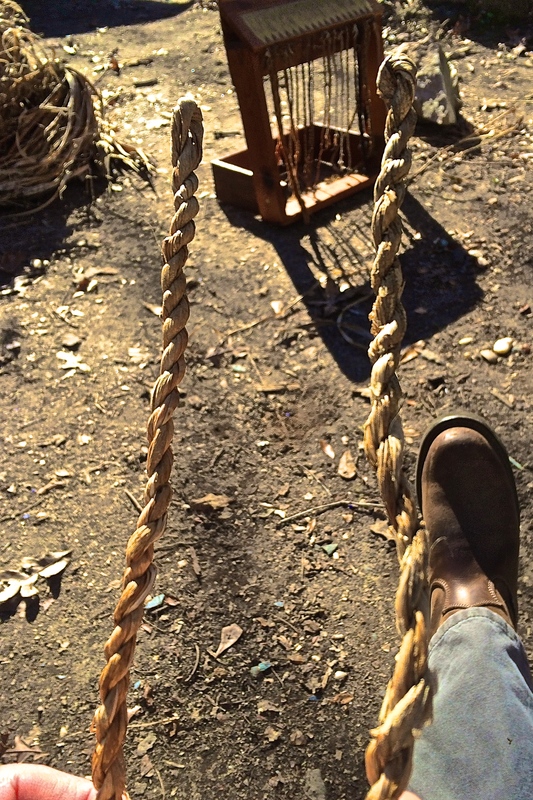 Learning to make natural cordage is a skill every outdoors person should undertake. Get in the habit of collecting natural material when trekking or hiking through your woods. Inner fibers of trees like Tulip Poplar, Red Cedar, and Black Locust make excellent cordage. 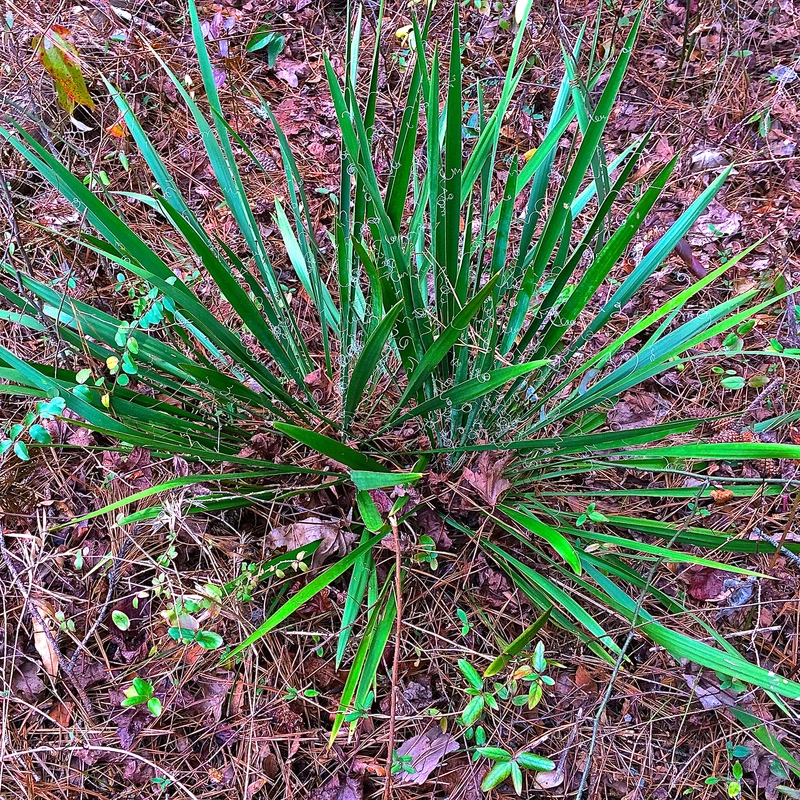 Nettle, Dog Bane, and Yucca are great cordage plants in my area. The skills that give you options when modern gear fail will be of the primitive type. My journey into learning primitive skills continues. You never master primitive skills. There’s always something else to learn from thousands of years of history! 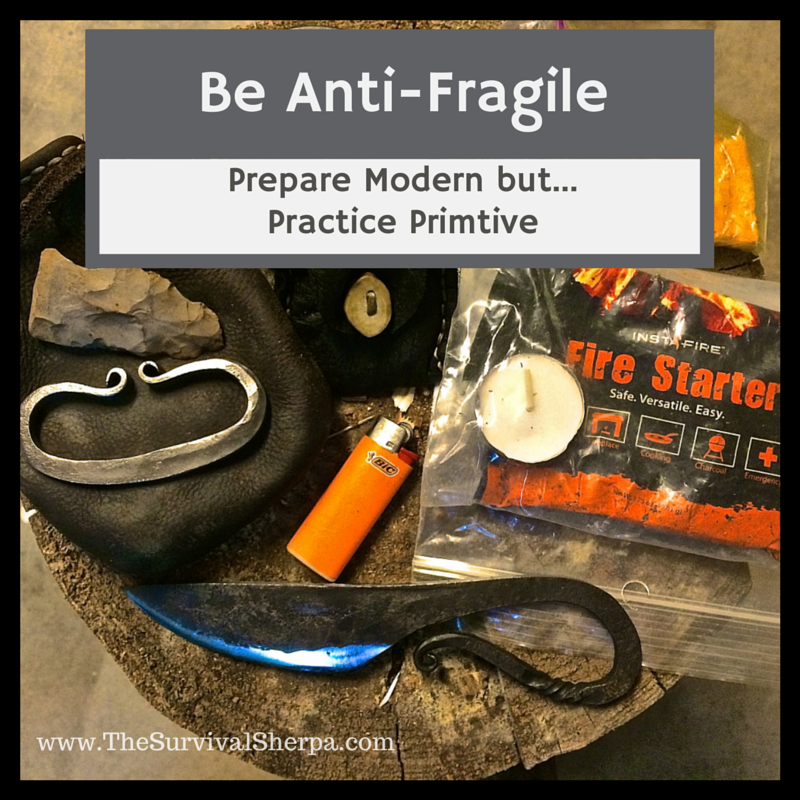 Taking the sage advice of Dave Canterbury to Prepare Modern but Practice Primitive has given me options… and made me a little more Anti-Fragile. I saw on your email that you sent me; you had a picture of a flint striker with a knife blade combination. My question is how does one get one like it? I really enjoyed reading your article. Thank you . Red Barn Forge made the knife striker, the steel and my knife. A Google search should find him. Thanks for reading and your kind words! I am not a guru of the survivalist world, so I do not have a full body of knowledge on what is written about. That said, I often wonder when and if the survivalist world and the hiker world overlap. I always think that if you want to prepare a bug out bag, spend a few weeks hiking a long trail! This goes sort of along the lines of primitivism, as you eloquently discussed. Fragile tools and resources are a huge concern to the thru-hiker. Thus a natural parring down of gear to the simplest and most reliable occurs by default. Well, just some thoughts from the top of my head. Great article, and I may check out that book!